Get Ready For A New Skin And Health Care Revolution! Research Proves That Pearl Powder Literally Heals. 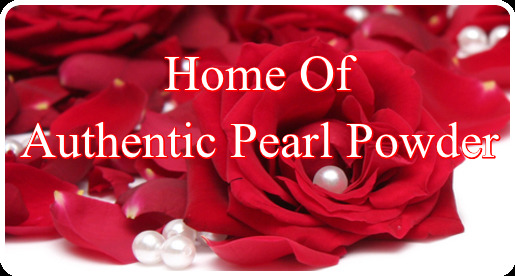 There is profound Scientific Evidence on the heath and beauty benefits of Pearl Powder. Research was amazed by the compatible relationship of the pearl and the human body. In 2004, they discovered the The DNA involved in the creation of peal is nearly identical to the part of the human DNA that is responsible for the regulation of calcium metabolism in the human body. In other words, Humans share a deep-rooted kinship with pearl, all the way down to the DNA level. The elements that make pearls luminous and strong, in fact do the same for skin and body. This precious deep sea Gem works magic by delivering medicinal healing properties to the skin, hair, nails and body. Researchers claim that various components of pearl can stimulate the metabolism's activities of the genetic material in a cell - the DNA and RNA - thus promotes and accelerates the regeneration of new cells. Keeping the DNA molecular structure intact ensures the maximum amount of nutrients and proteins are absorbed by the body. Reasearch concludes that pearl literally heals. Science validated that pearl powder enhances eyesight and treats and prevents eye diseases such as Nearsightedness. Clinical studies have shown that pearl treats chronic mouth ulcers and skin ulcers. Research considers Pearl powder to be most effective in rejuvenating and revitalising the skin. Studies show that pearl powder slows down and even reverse age-related damage for enhanced quality of life; that pearl is not only entirely compatible with the human bone, it can also activate new bone foundation and development, and increase bone mineralization. This makes pearl the perfect tooth filler, bone strengthener and bone substitute. Studies have shown that pearl powder promotes the production of collagen and elastin in your skin. It also acts as an antioxidant and promotes production of glycosaminoglycans. GAGs are the major sulfated glycan in green algae found in the ocean which oysters and clams feed off of. GAGs are sulfated glycans that regulate various biological and medical functions. Glycosaminoglycans' primary role is to maintain and support collagen, elastin and turgidity (bounce) in the cellular spaces and keep protein fibers in balance. The sea is a wealthy environment of unique GAGs. Studies have also shown that pearl-dependent enzymes help firm, smooth, and soften the skin quicker than other anti-aging skin care products. In addition, the peptides in pearl have been shown to remove damaged collagen and elastin from the skin and scar tissue. The antioxidation and anti-aging efficacy of various extracts of pearl powder were assessed. The protein extract of pearl powder exhibit the highest antioxidant activity as well as effectively prolonged the life span of C. elegans to showcase its anti-aging property. Pearl powder administration showed a substantial increase in total antioxidant capacity, total thiols, Glutathione content, enzymic antioxidant activity as well as considerably suppressed the lipid peroxidation products. Pearl Powder is the most powerful antioxidant. Studies have proven that pearl powder enhances the activity of super oxide dismutase (SOD), one of the body's main antioxidant enzymes which quickly and thoroughly removes melanin or pigmentation, thus to make skin brighter. It also reduce peroxidation, one of the major aging processes of our body. SOD is important for our health and longevity. It plays an important role in maintaining lung function, vascular tone, the contractile activity of vascular smooth muscle cells in the walls of small arteries and arterioles, is the major determinant of the resistance to blood flow through the circulation. It is is dependent on a complex interplay of vasodilator and vasoconstrictor stimuli from circulating hormones, neurotransmitters, endothelium-derived factors, and blood pressure. Also, it plays an vital part in the metabolism, and in the prevention of such diseases as atherosclerosis, diabetes, and arthritis. Scientific studies show Pearl Powder to be the finest source of calcium available. It absorbs nearly twice as well as regular calcium carbonate with vitamin D. French scientists have proven that pearl can reduce bone loss. They discovered that pearl is one of the most effective ways to prevent osteoporosis. Chinese scientists discovered that taking pearl powder internally can extend the life span of silk worms, mice and fruit flies by 20% to 57%. Translated to the human, with our current life style we may live up to 80 years old, taking pearl powder we may live up to 96 or even to 125 years old. Reasearch confirms that pearl can increase skin regeneration, thus help improve skin tone and promote youthful looking skin. In fact, pearl can help keep your body in shape and make your muscle and organs strong. Pearl when taken internally slows down the aging process, build cells, protects us from bacteria, viruses, and the development of cancer cells. Research also indicates that pearl powder can speed up the healing process of a variety of skin conditions from rashes and redness, to healing wounds and treating burns. According to the best known Chinese herbal book, �Ben Cao Gang Mu� or �Materia Medica� by Shizhen Li (1518-1593), pearl can stimulate new skin growth, release toxins, speed and improve healing, remove sun damage, alleviate age spots, and promote more radiant, younger looking skin. It has special attributes for removing acne, acne scars, skin ulcers, melasma (which causes freckles, age spots, and dark patches on the skin), wrinkles, as well as nourishes the skin and makes it smooth, fine, elastic, healthy and naturally beautiful. Pearl Powder also contains a natural sunscreen. Studies shows that pearl can promote a calming effect on the nervous system and ease pain. They discovered that pearl can increase positive "elevated mood" neurotransmitters, thus reduce stress levels, and promote peaceful, positive Internal energy. Research indicates that pearl powder taken internally can improve heart function. They found that pearl powder can strengthen the heart and promote a regular heart rhythm without affecting the frequency of heart beat. This means more oxygen-rich blood is pumped per beat through the circulatory system without increasing numbers of beats. Similar studies have been reported that when pearl powder is taken internally, relieves dizziness, headaces and irritability, and improves sleep. They found that pearl can reduce lipid peroxide and cholesterol levels of coronary diseased patients, extends life span and also improves the quality of life. It also boosts immune functions. Pearl Powder helps maintain youthful function of cells and healthy telomeres, protects the body from harmful free radicals and target the sources of aging, such as oxidative stress. Pearl Powder is a precious gift that everyone needs in their life to be a healthier, happier and younger looking and feeling you.